BUT: once you get the hang of it, you’ve got it for life, and it’s like having your old eyelashes back - which, it goes without saying, feels pretty great. For a ultra-realistic look, you'll need to apply liner with a smudged smoky edge as outlined in this earlier post. The world-beating secret to applying and wearing false lashes is: start with half-lashes. By this, I mean buy a set of lashes, and cut them in half. The reason most lash-free ladies’ first attempts at falsies (including mine, may I add) fail miserably is that they are just too long. They literally don't fit your eyelid. But: if you start with short, manageable ‘mini-lashes’ applied to the outer corners of the eyes, and slowly work your way up to longer and longer sets, then voila! You want to buy well-made falsies which are reasonably thick and not ridiculously long. My absolute favourite brand is Ardell real human hair lashes, their Luckies style in particular, which are well priced (around £5 last time I checked) and widely available in Boots. For this to work you need good glue. Please please please don't bother with the stuff that comes with the lashes - all too often, it's just no good. My number one eyelash glue is Duo Adhesive which is available from MAC stores. It’s pricey (around £10), but totally worth it. Apply a thin band of the glue to the lash strip - not too much, not too little. Try and apply it to the top and side of the strip, not the underside. Let it dry for about half a minute - this is important, otherwise the lash won't hold on your eye. Step 5: stick 'em on! First, make sure the eyeliner you've already applied to your eyes is completely dry before going in with the lashes - wet liquid liner + glue = no lashes. After about a minute, gently take your hand away - and there you go. At least, that's the theory - but I'm almost certain that by this time, you will have either got glue in your eye, lost the eyelash, or had it fall off at the last moment. You’ll also be paranoid about them then falling off within half an hour, which they inevitably will the first few times you try. (This is why you'll want to carry your glue around with you in your bag when you go out, for quick touch-up jobs). However, practice makes perfect, and after a while, it'll be a breeze - plus your lashes will look fantastic. You can totally reuse these lashes if you are gentle removing them. You also need to carefully peel off the old glue that will remain on the lash strip - it’ll a black gunky clump from the eyeliner it was stuck to - in order to reuse them again. Be really gentle in doing this, using a sharp thumbnail, because if you rip it off too fast you will rip off the hairs too. Initially, false eyelashes are an expensive habit, as you’ll be needing a new set every two or three days (the lashes will be getting gunked up with clumsy glue application, or becoming ratty-looking quickly from removing the old glue). But after a while, you’ll be able to make one set last up to two weeks, which will save you from bankruptcy! LOL--thank you for the warning. I may or may not take a stab at the whole falsies thing since I'll be in chemo for a good three months, BUT I'm most thankful for the liquid liner and brow tutorials. I'd have never thought how amazing and REAL those two bits could look. 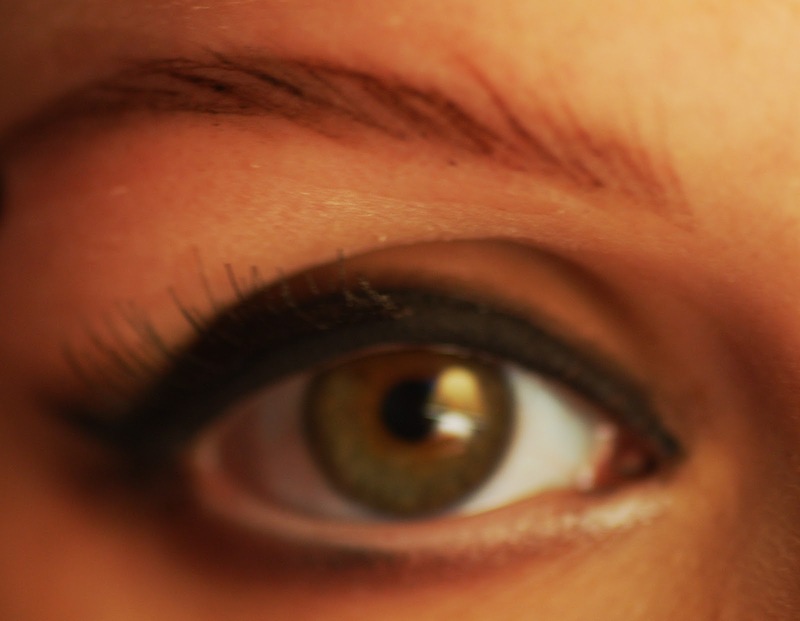 You are right that it's easy to fool the human eye, and the liquid liner blew me away on your eyes. And your brows as well. Totally thought they were real until you proved otherwise. Hi Carly, it's Sian…I ran into you in Montclair last weekend (that was a total God Thing as I had just googled how to apply false eyelashes during chemo and saw your video! ), anyways..I was hoping you could tell me the brand and style eyelashes you use please. It was super fabulous meeting you, you are a total Doll and God send!!!!! Hey Sian, loved meeting you last weekend! Fortune clearly made our paths cross! Hi! Thank you for all the information. I keep trying to wear the false eyelashes, any ideas as to why they may continue to peel off at the corners? Also, I feel like you can always see some glue globs. I'm usually pretty good at makeup and such but before alopecia, almost 2 years ago my biggest concern with my lashes was getting them to not hit my sunglasses 😟, times have changed and I'm really struggling getting the falsies to work. Using duo glue and everything you said. Hey Marney -- sorry, I missed your comment! If your lashes are peeling off at the corners, I think they might be a touch too long for your eyelids and would recommend trimming them down a little (because otherwise every time you blink, the're getting "squished" into the corner crease of your eye.) Another thing I'd recommend is curling your lashes slightly -- not just the actual lash hairs, as I recommend in the tutorial, but bending the arc of the lashes ever so slightly. This stops the ends sticking straight out and reduces the likelihood they'll peel off at the ends! As for the glue globs, I recommend only using a thin layer of glue on the lashes.